We recently went to see the new 'Far From The Madding Crowd' film (as good as the 1967 version with Julie Christie but why make it again?) 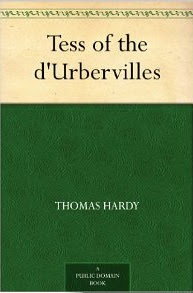 and as 'Tess' is a free Kindle download I decided to immerse myself again in Hardy's rural nineteenth century England, one I hadn't read before. In 'Madding' whenever anything begins to go wrong it turns out right, but in 'Tess' it's the other way round - everything that starts to go right goes wrong. Outstanding novel but a sad tale.